The roof attached to your home or business is so prominent that it’s often one of the first things people see when they pull up out front. If the roof is excessively dirty or the color is fading, it will reflect poorly on your residential or commercial property. Luckily, the Cerritos, CA roof cleaning and coating professionals at Custom Coating Restoration can help. We are a trusted color sealing company that can handle all your roof cleaning, coating, sealing, and color restoration needs. Over the years, there are so many things that can build up on a roof. From dirt to mold, they can make your roof look so unsightly that they ultimately have a negative effect on your curb appeal. Custom Coating Restoration can cleanse your roof with our proven roof cleaning techniques and power washing services. While those in Cerritos, CA often call on us to be their color sealing company, they also appreciate the roof cleaning services we can provide. Have you ever stopped to think about how much damage the sun could be doing to your roof? If you fail to do anything to protect it, powerful infrared light can cause your roof to crack and fade. It can even take a toll on the inside of your home or business by allowing an excessive amount of heat to get in, making interior temperatures nearly unbearable. Custom Coating Restoration can stop this by installing Cool Roof Coatings. We can also serve as your commercial flat heat reflecting roof sealer in Cerritos, CA. Tile, metal, and composite roofs are known to last for decades. But that doesn’t mean that they’re going to look their best forever. In fact, you should have a color sealing company like Custom Coating Restoration step in after some time has passed to ensure that your curb appeal is not affected. We can provide tile, metal, and composite roof coatings and sealing services in Cerritos, CA to keep your roof well protected for a longer period of time. Is it starting to cost you a fortune to keep your commercial property cool? It could be because your roof is baking in the sun. One way to avoid this from happening is by having a commercial flat heat reflecting roof sealer applied by Custom Coating Restoration. When your roof is coated with white and gray silicone roof coatings, it will block infrared light from penetrating and affecting the temperature of your business in the process. Tile roofs can be very beautiful when they’re new. However, their coloring can fade over the years and turn different colors due to the effects of the sun’s harmful rays. 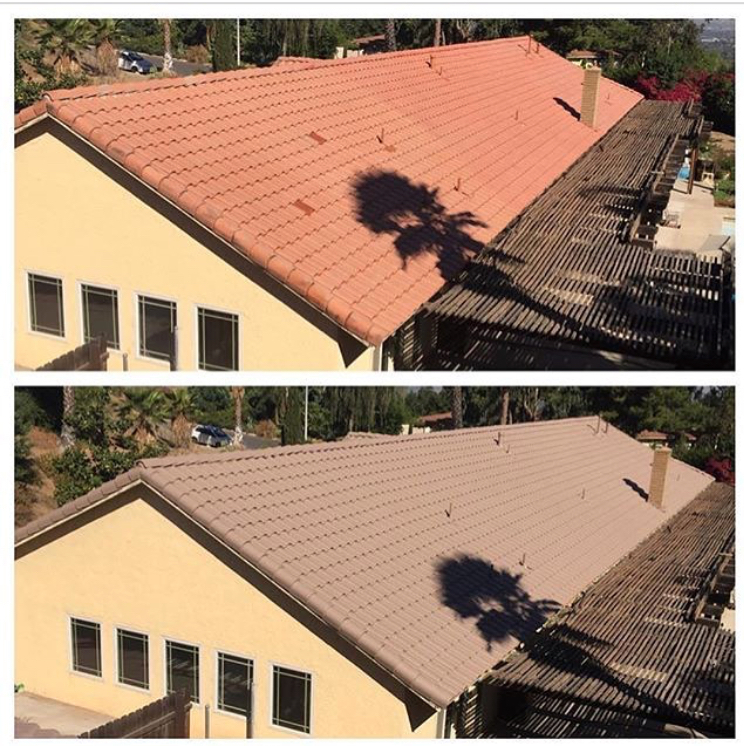 Fortunately, the Cerritos, CA roof cleaning and coating experts at Custom Coating Restoration can restore your tile roof with our roofing color restoration services. You shouldn’t have to live with an unsightly roof on your home or business. Rather than replacing it, let Custom Coating Restoration tackle your Cerritos, CA roof cleaning and coating job. Contact us at 800-621-6722 for assistance.